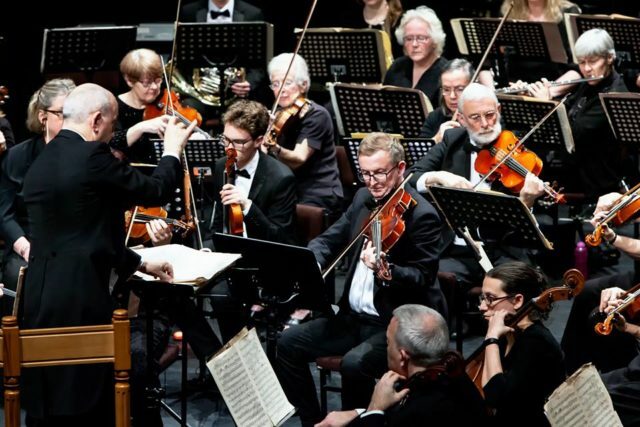 Jonathan shares his review of Isle of Wight Symphony Orchestra’s first concert of 2019. 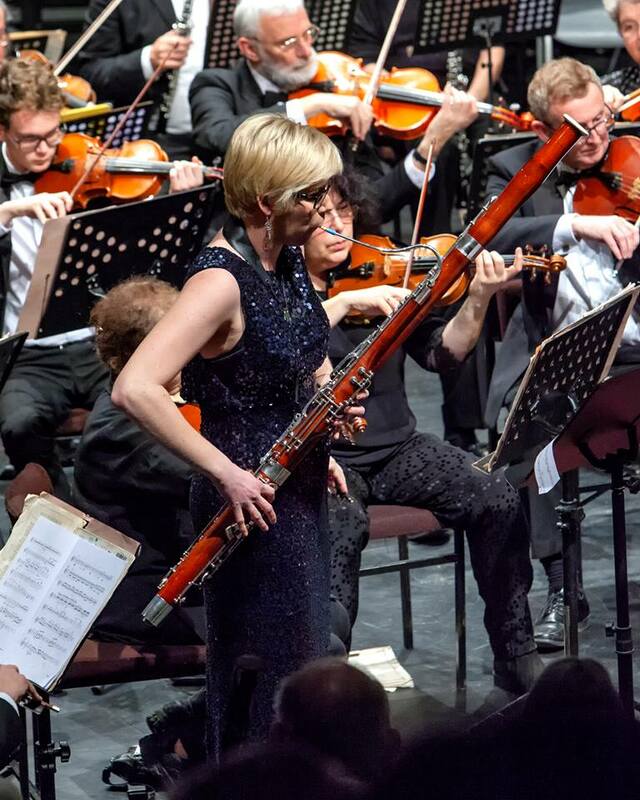 Find out what he thought of the Bassoon Concerto by Nino Rota, expertly played by Rebecca Eldridge. 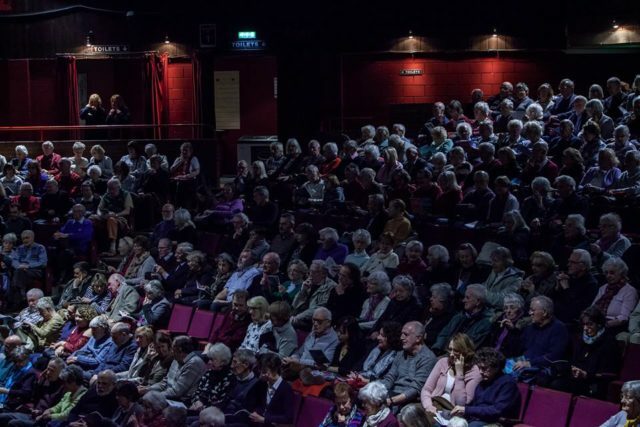 On Saturday last week we went to the second concert in the Isle of Wight Symphony’s 2018-19 season. Despite the wintry weather the house was packed, as usual, and, as always, we were treated to some fine music, magnificently performed. The opening piece was the Slavonic Rhapsody by Antonin Dvorak. I’m not over-familiar with his music, apart from the famous Symphony, the Ninth, from the New World, so I was looking forward to listening to this. In 1878 there was a revival and celebration of local music throughout Europe, because a lot of countries were rediscovering their own culture. Dvorak’s music was first published at this time, and became very popular by writing music that was recognisably Czech. This piece was full of dances, played energetically by the orchestra, varying delightfully in tone and rhythm throughout, and had a lively sense of drama and pace. I really enjoyed it, and will have to listen to it again. The second piece was completely new to me. Hugo Wolf was from Slovenia, and had an interesting and complicated life. He taught music, and was mostly known as an acerbic music critic, making enemies along the way. I read that with interest, and hope I’m not going to end up universally hated too. Wolf wrote many songs, and eventually settled down to composing. His Italian Serenade was based on the story of a young man setting off to make his fortune with his violin, and was meant to be a larger composition. 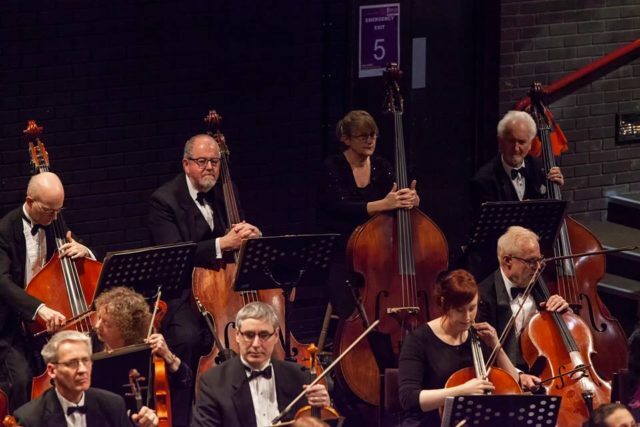 Several instruments were given prominent parts, and these were played with grace and panache, especially the viola, played by Tim Isard, supported by all the members of the orchestra. It was lively and very satisfying. At this point the orchestra rearranged itself for another first experience for me. I’m familiar with the music of Nino Rota, who wrote the brilliant theme for the Godfather. I had not known just how prolific he was, and I suppose that happens to a lot of film composers, whose music becomes part of the film rather than becoming known for itself. I had no idea he had composed a Bassoon Concerto. Indeed, before I saw the programme, I had no idea that anyone had done this. 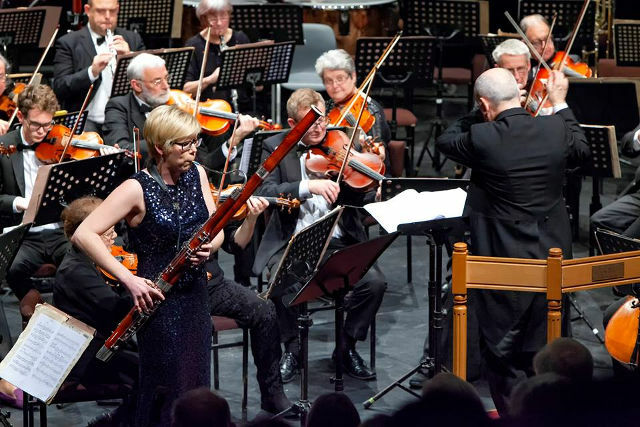 I don’t know about bassoon players, but I’ve always felt that they sit at the back of the orchestra and nobody seems to call on them very often to take the lead. I was intrigued to hear this concerto for myself. From the moment that the striking figure of Rebecca Eldridge strode onto the podium, clutching her Bassoon, I somehow knew I was going to enjoy it enormously. The bassoon itself is a rather long and complicated wooden pipe, with a lot of keys, and a thin metal tube emerging from its body containing the reed. There’s a lanyard arrangement around the neck for ease of carrying. It could look ungainly, but in Rebecca Eldridge’s hands it looked elegant and important. From the first notes, the rich, dark tone of the bassoon filled the auditorium, and it led the orchestra through all three movements, and through a range of moods and emotions. It was serene, and complex, and comical, and varied, and the last movement was a series of different short pieces that reminded me of Rota’s other side, because it felt almost like scenes from a film, each with its own character and feel, delivered one after another with skill and mastery and good humour. I really liked it, and I became a fan of this wonderful bassoon player. I hope to hear more of her playing. After the interval, the orchestra settled down to play us Sibelius’s First Symphony. He became a giant figure, not only in his home country, but all over the world, and wrote music that is stirring and beautiful and utterly distinctive. This symphony was a young man’s work, where he started to set out his style and themes. He was influenced by the passion and grandeur of Tchaikovsky, and admitted it at the time, and this symphony is not lessened by that. It starts with the clarinet playing solo over a drum roll, and then gets going with all parts of the orchestra joining in, with lots of pieces of tune and a range of sounds that seem at times to be random, but somehow stay together. As always, the Isle of Wight Symphony Orchestra played together magnificently, running through all four movements of this monumental symphony with skill and determination and enormous energy. 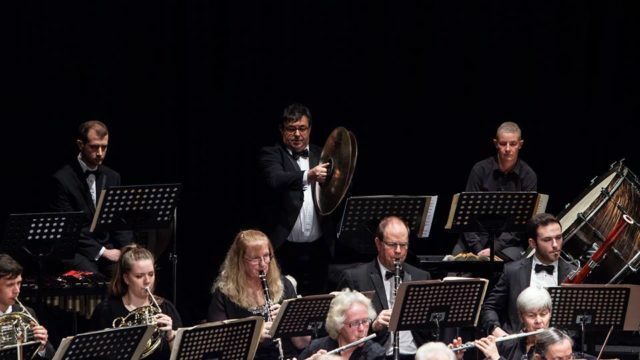 All sections of the orchestra gave their all, especially the poor timpani player, Richard Souper, who must have been quite exhausted at the end of the fourth movement. I’ve never been able to pin Sibelius down in my mind. Some of his music just flows and is beautiful, especially his tone poems. His symphonies are harder for me. It feels like he’s thinking on his feet while he’s writing it, but it isn’t clear to me what he’s saying. I think he’s a master of illustrating his own emotional feelings about something, and leaves us to decide for ourselves if we want to interpret it. 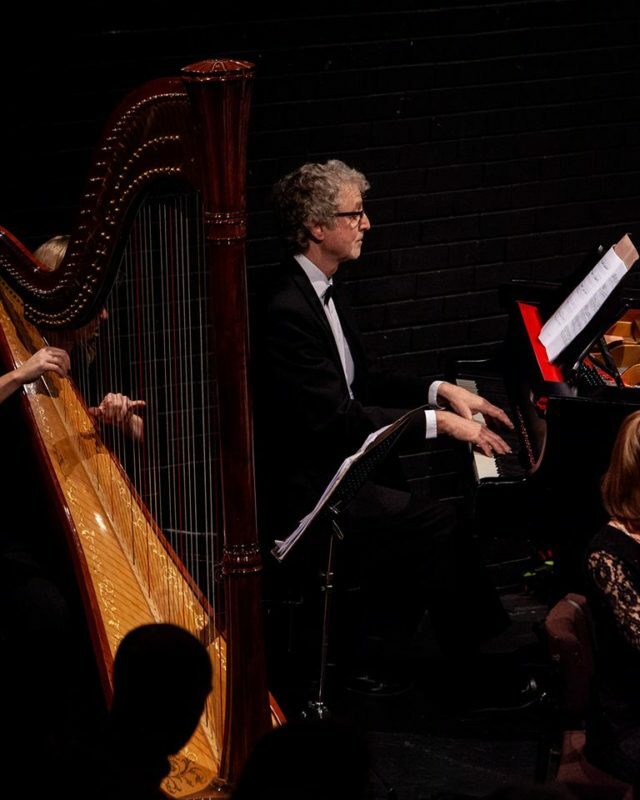 I just settle down and let it all play out, and I respond emotionally, while marvelling at the range of sounds and combinations that the orchestra produces, and their sheer stamina, just in reaching the end. They give it their all, I love to watch them, and I appreciate their dedication and their musical skill. Bravo. Who could not love Elgar? The next concert will take place on Saturday 16th March, at 7.15pm. There’s going to be an Outdoor Overture by Aaron Copland, which I shall enjoy very much, followed by a Ritual Fire Dance by Manuel de Falla, which I expect to be as hot and exciting as it suggests. Then there’s another first for me, a Symphony for Trombone and Orchestra by Ernest Bloch. I have no idea what that will be like, but I’m looking forward to it very much. All this is followed by Elgar’s Symphony Number 1, which will be sublime. Who could not love Elgar? Grab your tickets as soon as you can. I expect it to be sold out again.